Reconstructed capstone from one of the pyramids of the Giza Plateau, symbolizing Benben. Benben was the mound that arose from the primordial waters Nu upon which the creator deity Atum settled in the creation myth of the Heliopolitan form of ancient Egyptian religion. The Benben stone (also known as a pyramidion) is the top stone of the pyramid. It is also related to the Obelisk. Benben stone from the Pyramid of Amenemhat III, Twelfth Dynasty. Egyptian Museum, Cairo. In the Pyramid Texts, e.g. Utterances 587 and 600, Atum himself is at times referred to as "mound". It was said to have turned into a small pyramid, located in Heliopolis (Egyptian: Annu or Iunu), within which Atum was said to dwell. Other cities developed their own myths of the primeval mound. At Memphis the god Tatenen, an earth god and the origin of "all things in the shape of food and viands, divine offers, all good things" was the personification of the primeval mound. Bennu bird from an Egyptian papyrus. The Benben stone, named after the mound, was a sacred stone in the temple of Ra at Heliopolis (Egyptian: Annu or Iunu). It was the location on which the first rays of the sun fell. It is thought to have been the prototype for later obelisks, and the capstones of the great pyramids were based on its design. The capstone or the tip of the pyramid is also called a pyramidion. In ancient Egypt, these were probably gilded, so they shone in sunlight. The pyramidion is also called 'Benben stone'. Many such Benben stones, often carved with images and inscriptions, are found in museums around the world. 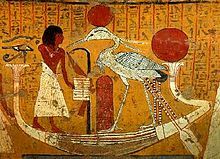 The bird deity Bennu, which was probably the inspiration for the phoenix, was venerated at Heliopolis, where it was said to be living on the Benben stone or on the holy willow tree. According to Barry Kemp, the connection between the benben, the phoenix, and the sun may well have been based on alliteration: the rising, weben, of the sun sending its rays towards the benben, on which the benu bird lives. Utterance 600, § 1652 of the Pyramid Texts speaks of Atum as you rose up, as the benben, in the Mansion of the Benu in Heliopolis. From the earliest times, the portrayal of Benben was stylised in two ways; the first was as a pointed, pyramidal form, which was probably the model for pyramids and obelisks. The other form was round-topped; this was probably the origin of Benben as a free standing votive object, and an object of veneration. During the Fifth Dynasty, the portrayal of benben was formalized as a squat obelisk. Later, during the Middle Kingdom, this became a long, thin obelisk. In the Amarna Period tomb of Panehesy, the benben is seen as a large, round-topped stela standing on a raised platform. Wikimedia Commons has media related to Pyramidia.